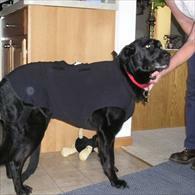 I have recommended the Anxiety Wrap with much success in my practice of veterinary behavioral medicine. The balanced and specific support it provides has helped reduce fears and phobias associated with thunderstorms and other stressful event in many of my patients. There are a few products on the market that are designed to help reduce arousal. As such, they indirectly aid owners in controlling their pets as well. These products include various forms of body wraps including the Anxiety Wrap, Face Wrap, and the Calming Cap. This is Tango, in between filing his nails. He is usually very worried and I have to follow him around the house as he tries to get away. When we startet filing this time he was also worried, but then I put the Anxiety Wrap on him and it calmed him down enough to sit still in an armchair where he usually sleeps. No more chasing around for him! Next time I will put on the Anxiety wrap again and observe if he is more quiet when we start filing. Moegley is my 6 year-old yellow Labrador retriever who has suffered with anxiety for his entire life. He has demonstrated fear-based aggression through full-blown panic attacks. About a year ago, I thought he was having a psychotic break. He was running around the perimeter of the house, jumping up on my kitchen table trying to climb out windows, fighting with his brother (my other dog Jack) and at times literally trying to crawl inside of me for what seemed like a refuge from his torment. He looked possessed and nothing I did soothed his terror. After a night of no-sleep I called his vet and was referred to an animal behaviorist. The vet did discover an ear infection but also witnessed one of his panic attacks, which confirmed my gut instinct that his anxiety was out of control. I went to visit the behaviorist to talk about what was going on. She had many theories as to the sudden onset of this episode (from obvious and logical (such as pain from the ear infections), to a little far stretched (a bear may have been trespassing on his property) to just down right obscure (a spirit in the house). She did provide me with some tools to try at home and much needed reassurance. As I was about to leave she said, “I have one more thing you might want to try. It’s worth a shot. 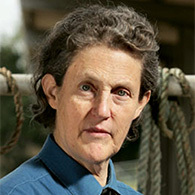 Have you ever heard of Temple Grandin and her work with autistic children?” Being an OT, she now had my full attention. She continued on to say that someone had created an “anxiety wrap” for animals that suffer from anxiety and asked if I would be willing to try it on Moegley. I ecstatically shared with her the work I do on the psychiatric unit, which includes using deep pressure strategies (such as weighted blankets & vests) and of course I was willing to try it with Moegley. And so began Moegley’s sensory diet. For six months we had a strict schedule to help him self-organize his system, providing him with fun positive physical activities in hopes that it would provide him with a feeling of safety and security. Every few days I would increase his time in the Anxiety WrapTM and within a few days of being on his sensory diet he was sleeping through the night. He slept with the anxiety wrap on and actually would come running over to me when I would pick it up. Almost 1 1/2 years later I can say his anxiety has dramatically decreased. Prior to Moegley’s sensory diet he feared going to the vets to the point that he would either refuse to get out of the car and/or go into a full panic attack which included loss of body function, trembling to the point he would collapse on the ground, panting and drooling profusely. 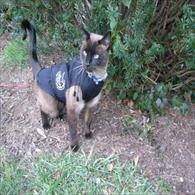 He now easily jumps out of the car dressed in his Anxiety WrapTM and with a bit of encouragement and praise he breezes through exams, shots and even X-rays. Update – Alison has informed us that Moegley has improved so much, he no longer needs his Anxiety Wrap! Here’s a photo of Brandy resting with the anxiety wrap on, during a fierce Thunder Storm tonight. She is so calm..and relaxed!! I have never seen anything like it! This is the best money I have ever spent!! Unbelievable results in just a short time! I also passed out a few brochures to the other Instructors so they can check out your product too!! I know I read somewhere about it being able to help epileptic dogs too?? 4 young puppies. All were adopted except for Ryan. He was suffering from severe separation anxiety and fear of everybody and everything. I can’t say I blame him. I had purchased an Anxiety Wrap last year for one of my senior goldens who suffers from thunderstorm anxiety. I saw how it calmed him down, so I thought why not try it for Ryan? His size small wrap came last month. He wasn’t too sure if he liked it at first, but now he loves it. While his anxiety hasn’t completely gone away, we have seen a significant improvement. He loves it ! I take it off to groom him, and when he sees me pick it back up he immediately comes and sits in front of me to have it put back on him. 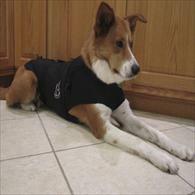 In fact, I just ordered a second one for him so that he has one on when one is in the wash. And he looks adorable. I told my holistic vet about it and brought him all the information so he can recommend it to his other clients. And of course Ryan was the model ! I’ll send you a photo of him wearing it while he’s out playing King of the Hill in our backyard. I recommend these to everyone I meet with separation anxiety or thunderstorm anxiety dogs. Ryan is a wonderful little guy; the wrap hasn’t solved his problems completely but it has helped tremendously. And to think he was almost put down for being un-adoptable! We have an annual ‘celebration’ in Britain called Guy Fawkes night which is on 5th November. Munro, our Jack Russell, is terrified of fireworks and thunderstorms (of which we fortunately have very few), so we had to wait until now to test the anxiety wrap. 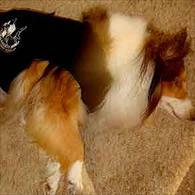 He was shaking quite badly when he heard the fireworks despite our playing him his Sounds Scary CD repeatedly for several weeks beforehand, however, after only a few minutes of him wearing his anxiety wrap he quickly settled on the floor at my feet, relaxed and fell asleep. Thank you very much for this fantastic aid. Whenever we’d leave the house for shopping/visiting/church AND return, Brijit would be like a jumping jack and crying/screaming/barking, spinning in circles. She “came to us” this way and I tried shutting her in her Kennel after we’d get home but it was almost impossible to catch her and by the time I did get my hands on her – I was concerned she’d wet – so I’d take her outside. Nothing was accomplished in her training and I know I was encouraging her behavior. Well, this morning before we left for church, Brijit’s “Wrap” was put on her and when we left, she was in the computer room on the heated-pet-window-shelf – caring not – that we were leaving. When we got home she met us at the door (no scratching/whining/jumping) and showed a little joy by giving a couple of quick woofs. We took off boots, hung up coats and she’s just following us around….quietly!!!! Sarah is sound reactive to anything associated with fireworks, or gun fire. I never thought of making this a daily sound she encountered as a pup. Air brakes on semi trucks, air horns beeping, train sounds and horns, none of those are a problem ——– but the unexpected *pop*, and more added to it, took her soul from her body. After two years of intermittent exposure to such sounds, she would go vacant eyed, and begin to vibrate, not just shake. Totally unable to work, or to alert to my medical condition. Fear took over her life at the first ‘pop’. If at home, Sarah wanted to hide in the far corner of the kitchen, if we were out, she wanted to lead me home as fast as possible. I wanted to do something positive for Sarah, to help her overcome this fear response. She helps me so very much when out in public, I couldn’t bear the thought of losing her to fear. It just broke my heart to see her so frightened and unable to cope. The first day the Anxiety Wrap arrived, I put it on her ——- in a non-stress time. 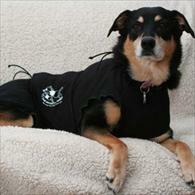 She wore it without fuss, as she is used to wearing a cape that identifies her as an aide dog. She relaxed, and fell sound to sleep. She awoke, and went out to potty with the Wrap still on. After a bit, we went for a walk in town. Since the 4th of July, Sarah has been very hesitant to go anywhere, just waiting for the *boom, booms* to start ——— we had encountered a few while out for a walk before the 4th. Wearing the Anxiety Wrap, we just boogied through town. No stopping to look concerned at what *might* happen. A bit of a treat, intermittently, and we were on our way. So very relaxed. After a walk of a couple miles, and visiting in one store, we returned home. I removed Sarah’s Wrap 15 minutes after we returned, and she settled down at my feet, to sleep for two hours. Today is July 8, and that is the most peaceful rest she has experienced since July 1, when all the firecrackers made their debut around our home. This evening, a firecracker went off. I grabbed the Anxiety Wrap and put it on Sarah. Within moments she stopped shaking, and was able to take a tiny treat of cheese from me, each time a firecracker sounded. She didn’t try to hide, she stayed by my feet. She fell asleep, and the rest of the firecrackers went un-noticed. Great things will happen in the future ——- the pop of balloons at the local fair will not be such a bother ——- the gentle training of such will happen, wearing the Anxiety Wrap, ahead of time. Peace shall rein, and Sarah will not be feeling so anxious and fearful. There are great things in our future, and the Anxiety Wrap is part of the picture. I ordered an Anxiety Wrap around three years ago (when I lived in Thomas, West Virginia) for my dog Henry. I was a volunteer foster mom for the local humane society and because they knew I had a weakness for black labs they brought Henry to me when he was rescued from the local state park. He was a skeletal black lab/great dane(?) mix, and we immediately got him vetted and on the road to feeling more secure. However, thunderstorms, fireworks, or any other loud noise made him hysterical and uncontrollable – he couldn’t “get away” from the terrifying thing making the noise and could be really destructive in his panic. I loved him but knew he would be impossible to place or keep with this emotional problem. I found you on the internet, and you were so wonderful to talk to on the phone, and although my friends and family thought I was nuts I ordered the anxiety wrap and tried it. Right out of the box, as soon as I put it on him he lay down and had the deepest, most restful sleep I had seen him have since he was rescued. He went absolutely limp, and snored! I started using it for thunderstorms (and New Years Eve and the Fourth of July) and there was an immediate and amazing difference in his behavior. He was no longer destructive and hysterical, and after a year of using it less and less he didn’t need the vest to feel safe. I don’t even know where it is now! Today when we have a thunderstorm he paces for about 30 seconds, then goes and lies down somewhere he feels safe – like the bathroom. He may pant a little or pace a little until he gets settled, but nothing, I mean nothing like the destructive hysteria we used to experience. I credit the anxiety wrap for saving Henry – and helping him become the cherished and healthy family member he is today. I often send your web site link to people who mention similar problems with their dogs, and today when I did that again I thought – I want to let Susan know how much she helped Henry, and how I thank her in my heart every time (like today) we have a thunderstorm and he is okay. So thanks again! It really worked! I am always recommending your anxiety wrap whenever it’s appropriate. I use the Anxiety Wraps for their intended purpose but I have also found them extremely effective as a body support after hernia repair especially in the flank area in small dogs. 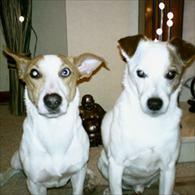 They also are helpful in dogs that are epileptic as it seems to decrease the number and severity of seizures. I have had an anxiety wrap for my lab mix Maggie for several years. 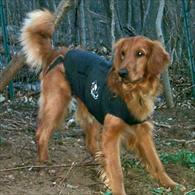 It has helped her tremendously with her fear of thunder and storms. I recently discovered another use for the wrap. 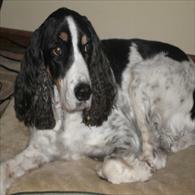 Maggie, age 12, had to undergo an adrenalectomy, major surgery to remove her adrenal gland, which had a tumor on it. 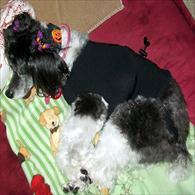 She had an incision almost the entire length of her abdomen. 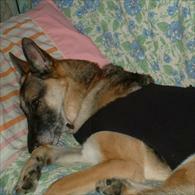 A few days after coming home, she started to lick at her staples and incision. She hates e-collars, so I thought of the anxiety wrap. It covers the incision nicely, stays on, and she is very comfortable in it while she heals. You should market it as a post-op tool as well! Thank you again for developing such a wonderful product. I’ve met many different types of animals and each one has their own personality. Being a teacher of children, one learns children want and need boundaries and rules. In some ways dogs are the same. If not given boundaries and rules, both run amuck. Fortunately, we’re continuously given new and wonderful products that help us in our work of training and caring for dogs. 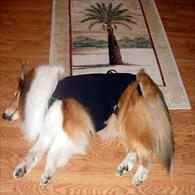 The Anxiety Wrap helps many dogs fearful of sounds and noises of all kinds. Thunderstorm fear seems to be one of the most common complaints. Having a dog myself that would dig in walls to try and escape from the storm; I can readily understand my clients’ frustration and helplessness. 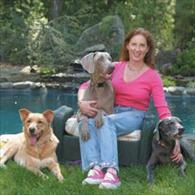 I know from my own experience the Anxiety Wrap works and has worked on many dogs at different levels of intensity. 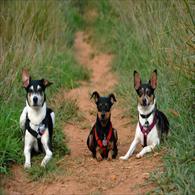 Any amount of relief, preferrably without drugs, can only be helpful to the animal. The Face Wrap and the Anxiety Wrap, sometimes used in conjunction has also helped many dogs suffering with travel anxieties, car anxiety being the most common. Some dogs get so excited their barking becomes uncontrollable. The Face Wrap causes them to become aware of their own vocalization, which in turn allows their mind to begin to focus and self control is achieved. When this happens their anxiety lowers and the ride is enjoyed by all. We as trainers are so fortunate to have tools such as the Anxiety Wrap and Face Wrap in our arsenal. Without them, our jobs would be much more difficult and sometimes futile. 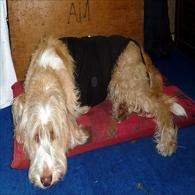 I have used the Anxiety Wrap extensively with thunder/noise phobic dogs for the last 9-years. 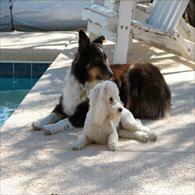 My clients’ dogs who have been fearful for years have also found great success finding their dogs calmer with successive use. 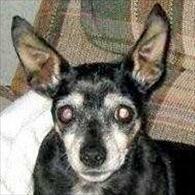 Bailey, a dog who had destroyed the walls and furnishings of her owner’s apartment and was hysterically afraid of thunderstorms and loud noises was brought to us as a last chance before euthanasia. She had been heavily sedated during storms and yet still hysterical. Use of the Anxiety Wrap along with ignoring frantic behavior and providing her with a “safe place” enabled the dog to learn to calm herself during storms and the 4th of July fireworks. This same dog also learned to overcome separation anxiety that led to her becoming my “project”. For several summer months Bailey would look for her Anxiety Wrap when she sensed approaching storms. Today she no longer needs her Anxiety Wrap to weather the storms. 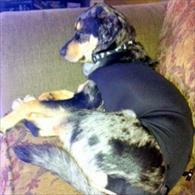 The same protocol allowed a veterinarian who had been medicating a thunder phobic dog, to eliminate those drugs once the Anxiety Wrap was used. The dog (a cocker mix) is now calm during storms. He termed the Anxiety Wrap “a miracle” and continues to recommend it to his clients. We’ve both used the Anxiety Wrap for working with fear-based aggressive dogs, achieving both focus and calmness. The Wrap is great help in overcoming many behavioral challenges that get in the way of a dog learning to change behaviors. 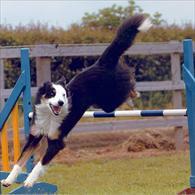 I have also used the Wrap with agility dogs who become too frantic and unfocused during a run. An out of control yorkie with an excitable owner was able to complete a clean run the first time she wore the Anxiety Wrap. Her performance improved with continued use. Because the dog was able to remain focused, the owner was also able to calm down. The effect was cumulative for both. The Anxiety Wrap seems to have the same effect on animals as swaddling a baby. A good comparison can be found in the work of Temple Grandin with animals and autism. It brings all the “parts” together and calms the individual allowing them to refocus attention. I asked for 2 Anxiety Wraps, one for our Beagle Burnsie and one for our Shephard/ Collie Mix Lucky Boy. Both Dogs were Strays out of our Park. Lucky looses all his cool when Thunder is imminent – he tries to get outside, crawl over our Chain link fence and run around in circles. He found himself the safest spot in our house – with his face under my husbands bed. He breathes very hard, shakes with all his body and curls up to a ball. With the wrap he gets back to breathing normal, still likes to lie infront of my husbands bed but is totally changed when wearing the wrap. I am so thankful that you invented it and I got to knowing about it. Burnsie the Beagle, has not worn it yet. He is more scared of shooting and such noise which is bad since we live close to an military installation. So far I did not put the wrap on him and cannot tell you results since shooting happens not quite as often. Before I know it the shooting has stopped. 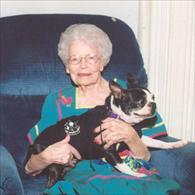 Ordered the Wrap several months ago for my elderly friend’s Boston Terrier to help during thunderstorms. While the dog is not completely calm during storms, we have been able to eliminate the 6 mg.(!!) of Valium we had been using without much success. Thank you so much. 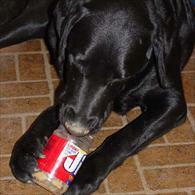 Our veterinarians have started recommending it citing our success. I’m a dog trainer and behavior consultant. I had heard about the Anxiety Wrap and wanted to learn about it from direct experience so that I could advise my students about its value and uses. 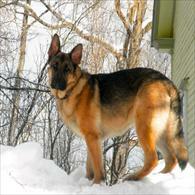 Fortunately, I had a perfect guinea pig/model in my own young German Shepherd boy, Caro. At the time, he was about 1 1/2 years old and, as my vet put it, full of life! A very high-energy, high-drive dog with enormous exuberance for everything. I wondered if the Anxiety Wrap would have a calming effect on him. I had a little trouble figuring out how to put it on him but finally managed it. Then, following instructions, I sat down to read, ignoring him but watching him out of the corner of my eye. For the first couple of minutes, he stood absolutely still – as if he just couldn’t move. A nice example of what’s called “tonic immobility”! Then, he disappeared from view. Quietly, I got up and peeked around the corner of the kitchen into the living room. There he was – lying peacefully under a table with not a care in the world. I tried the Anxiety Wrap on him a few more times with the same result. 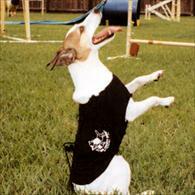 He was also able to wear it in our yard, playing with our other dog. He seemed just a little subdued – for Caro! I also tried it in a much more distracting situation – at a fun match in a local park. Again, the Anxiety Wrap seemed to take the edge off his high energy, making it much easier for him to concentrate and learn as we did a little training. I’ve been recommending the Anxiety Wrap to students, and I’ve heard good reports from all of them. This isn’t a very good picture but Tini is definitely relaxed. We had a GREAT night last night even with all the lightning and thunder…slept right through! As far as I’m concerned your product is a miracle!!! (I’ll keep trying to get a better picture). I wrote to you a while ago about my dog Muddy’s success with the Anxiety Wrap during thunderstorms. Attached photo is the proof — we’re sitting in Chicago with thunder rumbling around us. 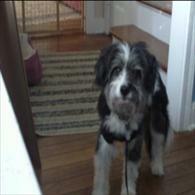 A little while ago Muddy was running around the house barking, very agitated. Here he is about 5 minutes after putting the Wrap on him! This seems to happen every time. I put it on him, he starts to settle down, and in a few minutes goes fast asleep. He seems to sleep very soundly too — if it goes on during the night, he wakes up in the morning in the same position. I thought that I would send you an update and let you know how Rylea has been doing. She is a totally different dog !!! She is so much calmer and thunder storms don’t seem to bother her anymore, as well. The neighbour even noticed a change in her. The house isn’t a crazy zoo anymore. It’s nice and peacefull. She’s back to her old self. Thank you, so very much, for all of your help. I greatly appreciate all that you did for us. Now the firework season is over, I wanted to tell you that even with the loudest bangs, Bertie was so much better, he would even go outside if the bangs were not too loud, and ate his food every night. We are really pleased with the Wrap, and have recommended it to loads of people, although I don’t understand how it works! Thanks again for your valuable help and advice, it was the least stressful firework season ever! The Anxiety Wrap is wonderful! 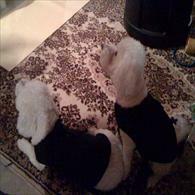 My dogs, Woody & Glory, love wearing them. We cannot thank you enough for the different they have made in our lives. It worked on the thunderstorm fear and the separation anxiety! I have never seen such a product! What a difference the Anxiety Wrap has made in Kipling and my life! Thank you your product is working wonders….i have taken Finley in the car for 2-3 ride and he hasn’t got sick once.I also have taken him in public places and he hasn’t barked in a mean way since getting the Wrap 2 weeks ago. I just wanted to email you & give you an update on our 1st experience with the wrap during a horrifying (according to Skippy) experience. We have the air show going on today at Mather, CA. I am usually very in tune with my dog & how he might feel at all times. For one reason or another I missed expecting him to be afraid of these jets that fly directly over our house. Because I didn’t even think that he may need the wrap prior to the show starting, I didn’t put it on him (I know, how horrible of me, I felt awful). Our big scary events are usually on the 4th of July, and during thunder storms. The jets started their show & Skippy was following me all over the house shaking uncontrollably. I ran to get the wrap, and put it on him in record time (even while he was laying down & shaking like he was)!!! And all of the sudden, he got up & was following me around, prancing (not shaking). He even had a smile on his face! I swear! He sat down next to me, no shaking! Well, I’m sure you believe this story. My husband & I are still dumbfounded. Skippy LOVES his anxiety wrap! I just want to thank you so very much for this wonderful gift! I’m Bob, an 11-year Cavalier King Charles Spaniel. My life hasn’t been as difficult as some, but for me there have been some trying moments. My sister and I were separated when we were 5 years old and she was my touchstone. Although I was told it was best for me to go to a different home, it still was hard. My new people love me and understand my little quirks. After all, my uncle lived with them his whole life and my new mom used to baby-sit for my grandmother. But still. My new people took me in, hang–ups and all, and I’m sure it wasn’t easy, but I’m such a nice guy. I learned that a bath wouldn’t be the end of the world. I learned that Cavaliers have coats and were and were meant to be lap dogs. 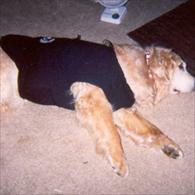 I was extremely overweight, which was a problem because I have heart troubles, and I was shaved down to the skin. It was a whole new world when I got to my new home. Times have been good, but as I have gotten older, and some say more handsome, I have adopted some quirks that are less than pleasant for those around me. My biggest problem is when we car ride I do nothing but bark. I do OK when were on the open road, but let me get into town and I’m not a happy camper. Mom tried most of the conventional methods, other than heavy duty meds and nothing seemed to help. Then she read about the Anxiety Wrap in Prevention. She called about the wrap and ordered one for me. In talking with Ms. Sharpe it was also determined that I should wear a face wrap while in the car. After wearing my “new clothes” for about three weeks now, my mom says I am a much happier boy (more comfortable in my own skin) and much more pleasant to be around when we go for car rides. She certainly wishes she knew of the Anxiety Wrap when I was younger. Nevertheless, it is going to be even better now. And as an aside, we have another girl who came to live with us (and her story isn’t pretty either). She takes all her cues from me, which hasn’t always a good thing. Since I am calmer now, she is too, and my folks are very happy. I bought the Anxiety Wrap for my 4 yr old Siberian husky, who has problems with anxiety. She is territorial and has some dominance issues that crop up under stress. She is anxious around strangers, and the excitement when we go places, or see other dogs, leaves her practically hyper-ventilating. When she wears your Wrap, she is calmer, and more focused. She has worn it going out on hikes, and we noticed that she doesn’t stress-whine as much or as loud, and generally seems happy and relaxed. In fact, the last time we saw another dog, and she didn’t do anything, highly unusual for her. I tried the wrap on my dog Bailey the day it came in the mail. She walked around with it on with no problem. I took it off and we both went to bed at 2 am i was awakened by a 70 lb golden standing over me panting due to the thunderstorm that had developed during the night. I put on the Wrap and Bailey immediately walked to her bed curled up like a cat and instantly fell asleep. She stayed asleep until the morning. she woke up rested and relaxed. The wrap is AMAZING> thanks so much. Being a first-class skeptic, I hesitated in buying the Anxiety Wrap for our “Chili Dog”, a six-year-old black-mouthed cur mix. He had developed such afear of storms that he would, at the first hint of a storm, try to climb up into the chair with me, and proceed to attempt to squeeze his 110-pound body between my back and the chair. He would pant heavily, and whimper, eventually working himself into a hyperventilating state. Out of love for Chili Dog, I decided to give the Anxiety Wrap a try. It was delivered on Friday July 20th, and I put it on him immediately, per the instructions for thunderstorm fear, and left it on for the recommended twenty-minute, first-time wear. The next day, just after I gave the dogs their lunch bone, a storm began brewing. I sat there in open-mouthed astonishment watching Chili eat his bone and TOTALLY IGNORING the coming storm! Previously, he had absolutely no interest in food during these “scary” times. I continued to eat my own lunch, keeping a close eye on him, so that I would be ready to put the Anxiety Wrap on him at the first sign of stress, per the instructions. The other two dogs began showing fear, and Chili looked at them wonderingly a couple times, then began showing signs that he might be getting ready to join them in their stress. I immediately put the Anxiety Wrap on him, and he laid down and went to sleep, never being bothered the rest of the storm. An hour or so later, I heard a large clap of thunder as another round of storms began brewing, and looked toward the hallway, expecting Chili Dog to come running to me . . . but he wasn’t there. A few more claps of thunder, and still he didn’t show. Fearing something might be wrong with him, I went looking. There he was, sleeping peacefully through the storm, snugged in his Anxiety Wrap! Fast forward to last night, July 26th, with Chili Dog not wearing his Anxiety Wrap. Same scenario: A typical Florida stomr coming in . . . thunder, rain, lightning . . . Chili Dog slept through the entire storm! I heard him roll over a time or two, heard his lips smack in doggy dreams, but never once did he have an iota of stress . . . he appears to be totally cured! The other two dogs, however, did show some stress . . . so you’ll be seeing my order for two more wraps in the very near future! The Anxiety Wrap is awesome. 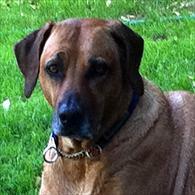 I have a 3 yr old bull mastiff/lab mix, Ginger. She has O.C.D, and anxiety disorders. 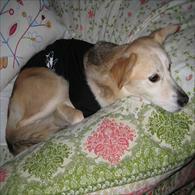 I also have a Great Pyrenees/hound mix, Shelby who has thunderstorm phobia. I am a dog behavior specialist, and was beginning to lose hope with Ginger. when ever she experienced anxiety she would have displaced aggression towards Shelby. Ginger was removed from mom and litter mates at 10 days old. I have struggled to teach her calming signals. I had trained her to “look away” when she was beginning to feel stress. It did not work if the fear anxiety was very escalated. By using the anxiety wrap on her, it all came together. The anxiety over things in her environment that she thought didn’t belong, which led to aggression are now under control and the displaced aggression is almost gone, we are conditioning it out with the anxiety wrap. If I know a situation is coming, I put it on her, and she can manage through it. For example when a jogger & dog off leash are running past she no longer attacks Shelby. She will bark, but it is normal and controlled. She is also able to handle the presence of too many people, and many other things that upset her before. Many of the O.C.D behaviors also went away, I did not expect that, or target it as something to change. With the anxiety reduced, compulsions are no longer necessary to relieve the stress. Shelby, Ginger and I thank you. I strongly recommend the Anxiety Wrap to my clients. I’ve been aware of the Anxiety Wrap for some time, and had considered getting one for my aging Portuguese Water Dog who was fearful of high wind. Now, at 15 1/2, she no longer hears the wind. 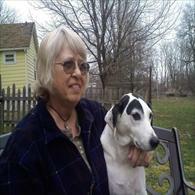 However, she’s slowing leaving us due to brain tumor, bad heart, and old age. A friend gave me an Anxiety Wrap to try for her – she appears so “tight” and uncomfortable. She took to it immediately, and seems very comfortable with it, wearing it daily. While we can’t change the fact she’s aging and dying from complications of old age, clearly we’ve been able to make her more comfortable by using the Anxiety Wrap! 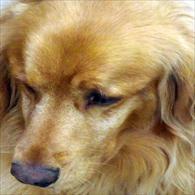 My dog Libby, a Golden Retriever, has a seizure disorder. The seizures are induced if the barometric pressure drops fast and hard enough, much as it does for many humans with epilepsy. Eventually she started developing anxiety symptoms whenever the barometric pressure dropped. I discovered that a certain way of holding her caused her to relax, and I showed my holistic vet what I’d been doing. She said that I was a human Anxiety Wrap and it would be a good idea to get one for Libby. I went right home and ordered it. Now whenever she is anxious I ask her if she “needs her vest” and she comes and sits for me to put it on. Then she goes to her own bed, turns, lies down, and sleeps peacefully. It’s a wonderful thing to see. If she is actually going to have a seizure event I can see it in her eyes and the vest makes no difference, and I know to medicate her. But now she can feel calm and relaxed whenever the barometric pressure falls. It is a blessing in this part of the country where that can happen every other day! Thank you so much for helping me help my sweet dog. I got a wrap for my standard poodle 3 (?) years ago. My goal was for him to quietly accept people into our home (I am a groomer that works at home), and to be examined by his veterinarian without growling and threatening. I used it consistently for about six months, then cut down use, and have not used it for a great while, yet continuing to re-inforce good behavior. Last week, Reno passed the test for Canine Good Citizen and has let his doctor do a complete exam. He asks for attention from my clients in the form of petting, which I did not believe would ever happen. I hope you are still advocating the use of your product, as I think it helped lead us to success. Attached is the picture of Lucy in her Anxiety Wrap. I have told my Vet about it also; hopefully they will have people try it out too. What a wonderful product. I love the Wrap as I do see its benefits immediately. The Anxiety Wrap has been the ONLY thing that has helped our dog. Before we had an Anxiety Wrap for her, either myself or my husband had to stay up with her–often all night–to keep her quiet enough for one of us to be able to sleep. What a relief. I am a nurse practitioner and really believe that the effect of the Anxiety Wrap follows the same principle of swaddling a baby to keep it calm, which has been done throughout history with infants, i.e., the Navajo using a cradle board, and the kangaroo sling. So, when her new jammies (Anxiety Wraps) get here I will try to get some cute pictures for you!! I must tell you that the Anxiety Wrap appears to have worked wonders on Boone, our Wire-haired Pointing Griffon, and his fear of thunderstorms. When I received the Anxiety Wrap, I followed the directions included as they pertained to Boone’s fears. Upon putting the AW on Boone (without any thunderstorm present), he relaxed almost immediately. I put the AW on Boone as soon as he exhibited signs of upset during the next thunderstorm. He was able to relax completely. 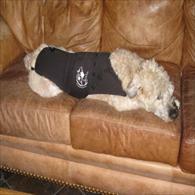 We had a thunderstorm last night (Monday, July 7) and Boone was relaxed, calm and quiet even without wearing the AW. 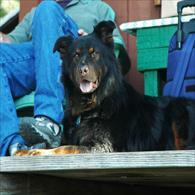 In the past (during a storm), Boone would have been pacing throughout the house, panting and whining. He did not do any of these things last night during the storm. We have another dog, Patton (a Shar-pei mix), who is also terrified of thunderstorms. Since he is about the same size as Boone, I put the AW on him today for the first time for approximately 30 minutes. Within five minutes after putting the AW on Patton, he completely relaxed and fell into a deep sleep. We are due for more thunderstorms this week and I will most definitely put the AW on Patton if and when he exhibits signs of distress due to any storms. My hope is that the AW will work as well for Patton as it has for Boone. I will let you know how the AW works for Patton. I have to tell you, my Anxiety Wrap for Wookie, arrived on Saturday. We followed the directions and as soon as we put it on him, this was the result. We haven’t had a Tstorm as yet, but pray it will have the same effect. 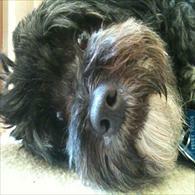 Wookie is a Soft Coated Wheaten Terrier/Golden Retriever (WHEATRIEVER!) mix rescued from an Ohio shelter. AND the true test is during a real storm. This was last night, as you know NE PA got hammered. Currently we are stranded at our home, safe, but can’t go anywhere because both bridges are closed. Anyway, I regress I know these pictures are surely OVERKILL, but we are so elated. Expect more sales, as the rescue folks are on to this and asking for the info. Also, thank you for having the BEST price around. Sleeping, actually SNORING, going outside, looking out the window, and on chipmunk duty. Thank you so much for getting the Anxiety Wrap to us so quickly! We are in the middle of thunderstorm season in Colorado and the 4th of July is just days away. We have used the wrap almost daily since it arrived and we are now into our second week. It has been a great help to our Vizsla, Tisza! 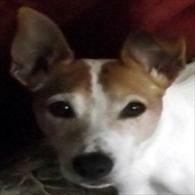 She is almost 11 and developed a real fear of thunder and fireworks in the last couple of years – it’s wonderful to find something that has helped her relax! I wanted to let you know that the anxiety wrap has helped enough so that at times, I do not even have to have it on her. Her fears are slowly dissipating! 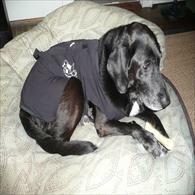 My dog Indy had knee surgery on Oct 12th. Bad night after the surgery, and I didn’t even think of trying to put the wrap on him. Now his leg bandage is off, and he’s off 2 of the 3 pain medications. Last night, Oct 15th, he had another bad night. He was very restless, and panting a lot. It finally occurred to me to try the wrap around 3 am. He settled down within 5 minutes and slept. Then I could sleep too. Now, if you will only make one in my size, we’ll be all set. The Anxiety Wrap has been so helpful to Lady with thunderstorms, finicky eating and situation anxiety. The vet techs could not believe it was the same dog because Lady was so calm! Thank you!! Success of the wrap – I put him in it twice a day for a week and noticed he was more relaxed when wearing it. I haven’t noticed any real effects having taken it off – the relaxation doesn’t seem to run on BUT the fantastic news is how much of a difference it makes when he has it on. On New Year’s Eve, when there are normally fireworks from midnight onwards I put it on him at about 11pm and tucked him into his crate. He had one bark ONLY at 1.15am AND THAT WAS IT! I’ve never had such a good New Year with him. What’s more, I’m using it when I take him and Bailey training. He wears it in the truck whilst I train Bailey in the early class, and instead of spending 1 ½ hours bouncing and barking with every breath, he settles down and goes to sleep. Not only is he not deafening the rest of club, but he is not exhausting himself before I start working him. Do you realise that this is the FIRST AND ONLY product that has worked with Tag EVER? I am just delighted! So many thanks again for all your help and advice. The Anxiety Wrap worked wonders on our recent weekend trip! It was much more pleasant for all of us in the car. About a month ago, we bought an anxiety wrap for our dog Honey Pig. She loves it! Because we have constant summer thunderstorms, she’s already had many opportunities to wear it . She comes to us when she senses a storm, and we put her in her “dress,” as we call it. Within a few minutes, she is sound asleep. The wrap has changed her overall demeanor, and she seems very happy and peppy after the storms pass instead of exhausted or drained. 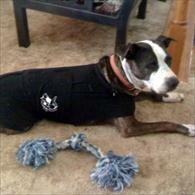 Because of the success that we’ve seen with Piggy’s wrap, we’ve ordered a wrap for one of our other dogs, Lucy. She seems to feel left-out without her own “dress!” She does experience some anxiety in response to storms or fireworks, although not to the level of Piggy. I want to tell you about Pete. He is my 7 year old Westie. He has from 10 weeks of age been horrible during storms. He would try to chase and bark the storm away, yawning with anxiety. I actually have many times felt this is how he will die, during a storm. I tried crating, crating with a dark towel over the crate. Placement in a room with a lot of light and loud music, placement in a dark room, drugs from the vet, rescue balm. NOTHING worked. I got the anxiety wrap about a month ago. First storm, sorta worked, he was tons better than ever before. Second storm he sat next to me on the couch and did a lot of yawning but IMPROVEMENT. Third storm, about the same. Last night it stormed all night and although there were a couple times that he moved around, he virtually made it thru the night fright free. I call it Pete’s Speedo and it is a miracle. Thank you, thank you, thank you. I just thought I would let you know that the anxiety wrap works wonders for our dog. Within 15 min, he ceases scratching at the walls and settles back down during thunder storms. I even had him out on the deck with the wrap on during thunder and distant lightening before it rained one evening and he was actually calm enough to play once it was in place! Thank you for your time. We have used the Anxiety Wrap for several of our patients with anxiety and thunder phobia conditions. We have had one patient not respond, however this patient had been through several medications, referrals to behaviour specialists and we were a last resort. All of our other patients have improved with the Anxiety Wrap. Improvements have ranged from needing to continually use the wrap to reduce anxiety, to completely alleviating the anxiety so that it no longer needs to be worn. 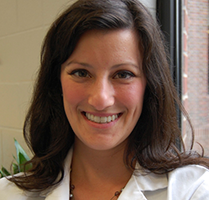 We have been very impressed with this non- drug approach to improving the quality of life of our anxious patients and their previously stressed pet parents! We recommend it highly. Just want to let you know how happy I am that I found you and the Anxiety Wrap. 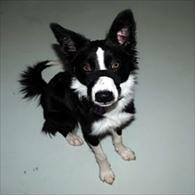 My border collie, Blou, doesn’t like any loud noise and thunder absolute terrifies him. When I heard about the Anxiety Wrap, I was really skeptical about its ability to calm Blou during a thunder storm and I thought the price was a bit high. I ordered it anyway. The very day it arrived, we had a thunderstorm. I put the wrap on Blou and instead of trying to get under the couch, he jumped up on it and went to sleep. He still doesn’t like the thunder, but he no longer quivers and salivates when he hears a storm. The wrap is great because it doesn’t restrict activity in any way, it’s easy to put on, and it works. I strongly recommend it without reservation to anyone who has a dog that is afraid of thunder. She went on to say that her brother ordered one for his dog and several friends in Connecticut have bought them too. Everyone is awed by the change in their dogs behavior when a storm is brewing and raging outside. Keep up the good work. 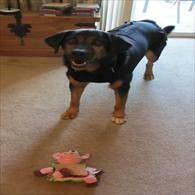 Adopted at one year, (Mookie’s) fear of storms gradually worsened. Distressed, paces, pants, clings, drools, keeps me up during the night, tries to escape into the back yard so she can run away from the storm, hides in the basement or the bathtub and each storm season is worse then the last. We tried (…) and other natural products that seem to initially work but lost their effect. A friend told me about The Anxiety Wrap and I figured it was either this or medication. At first I was apprehensive about the price because I didn’t understand out how it worked and still don’t know, but work it does! During storms she now relaxes & sleeps, sometimes she’ll snuggle but no more panting or drooling, she even eats treats during storms. I would recommend the Anxiety Wrap to anyone with a thunderstorm phobia dog. 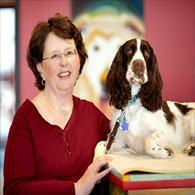 As a positive reinforcement dog trainer, I have been teaching basic pet manners classes for the past 6 years. During this time I have worked with many disruptive barking dogs. The Face Wrap, made by Anxiety Wrap, is the best training aid out there. According to its directions it works with the dogs body receptors and causes anxious barkers to settle down naturally, which, makes for a much quieter class! It’s not a muzzle. I have personally witnessed this product calm barking issues that include everything from anxious barkers, to bored barkers, and dogs that have a learned behavior of barking to get attention. I would not teach a class without having this product on hand. I purchased the Anxiety Wrap for my dog Bella who is also in training to be my service dog. Bella loves wearing it! Bella has some anxiety issues when we go out in public and needs some more confidence. (She in no way has aggression, it’s just fear). Over the weekend was the first time I was able to take her to the grocery store in her Anxiety Wrap and I was SHOCKED and AMAZED!! WOW!! This Anxiety Wrap is a miracle worker in our house! Bella confidently strutted through the store listening to me, watching me, and taking lots of treats! She even laid down in the checkout line fully relaxed watching all of the people go by. Pre-Anxiety Wrap she would have NEVER been taking treats or behaved so relaxed! This is a miracle worker! WOW! I was at the point where I thought she’d never get over her fear, but this one tool has given her confidence where training couldn’t. I am so happy that my Bella will be able to accompany me everywhere I go now comfortably! (Don’t get me wrong, we have some work to do, but this AW has cured about 90% of her fear!). WOW! My six year old Golden, Sam, suffers from thunder phobia that is getting worse as he ages. The anxiety wrap does help. Last night I put it on him during a storm. He settled right down, lying on the bed between my husband and me. When a second storm came through around 2 a.m., he was not bothered at all. I’m sure without the wrap, we all would have had a sleepless night. Thank you for making this wrap available. I have tried drugs in the past on other dogs with similar phobias, but nothing worked and they all had nasty side-effects. At last here is an easy-to-use and completely safe solution! After trying several different collars and devices, the anxiety wrap is a gently effective way to curb both my dogs excessive barking. Bailey my toy poodle, immediately quiets and lays down when she has the wrap around her muzzle. 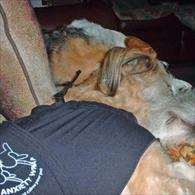 Lucy my Australian Shepherd now uses the anxiety wrap. It actually settles them down in a gentle manner. I am thrilled with the results. Thank you so much for such a wonderful product! I picked up an anxiety wrap on Friday (I came with Diana Anderson) and was able to use it during the thunderstorm this evening. 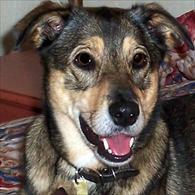 Mollie still sought shelter in the basement but wasn’t shaking, panting or tucking her tail. She would come up from the basement every once in a while and I decided to offer her a treat during one of these trips. In the past she has totally ignored treats during stressful times, but not this evening! She was relaxed enough to enjoy. Thank you very much for allowing this little gal to have some peace during a very stressful portion of her day. Thank you! It help Dinah, and I even think she’s learning to depend on it (I.e., knows it gives her relief). She’s only developed these noise fears in the past two or three years (or at least to this degree), so it’s been difficult to figure it out and to find a drug-free solution. I give her herbal supplements to help relax her (valerian, hops or passion flower drops), but at her age (12 years this month!) I didn’t want to dope her up with Acepromazine or other heavy pharmaceuticals. Daisy is much happier since we got the Anxiety Wrap for her. She will even do agility with a thunderstorm is the background. This was unthinkable before the Anxiety Wrap. Thank you so much! Of course, my daughter Angelica Steinker, M.Ed. C.C.B.C., CPDT, NADOI, owner of Courteous Canine Dog School and Doggie Gym, had this great idea for me to try the Anxiety Wrap and it worked! First of all, boundless, endless thanks for creating the Anxiety Wrap for thunder phobic dogs. With its first use our rescue Wheaten Terrier, Kasey who is 8 years old, was able to relax and stop destructive behavior during a storm for the first time since we acquired him at 7 months of age. Since we live in Central Florida, lightening capital of the country, it has been challenging adjusting our lives and efforts to keep him calm and safe over the years. Imagine our amazement after slipping Kasey into the wrap and seeing him settle down within a few minutes and even nap during a significant squall. Kasey has given us such joy over the years and now you have given us the ability to make his life happier and healthier. We will be forever grateful. We appreciate all of your efforts to assist dogs in need. Face Wrap – Thumbs and Paws Up! I’ve mentioned before that the only really behavioral challenge I have with Pip is her barking. She barks when she’s excited and she barks for attention. I’ve had a lot of success reducing the excitement barking when we get home from work by having her grab a tug toy in her mouth as soon as we walk in. I try and keep one near the door so that I can toss it for her right away. The attention barking gets ignored at home and we don’t have near as much of that anymore. Last weekend was our 2-day Karen Pryor Academy workshop where Pip had to remain in her pen for a good part of the day while the human students participated in activities without the dogs. The last time we attended the workshop, Pip barked off and on during the day. It wasn’t awful, but it would have been better if she could have laid down quietly like the adult dogs did. She’s almost 7 months old now and it’s harder for her to settle for very long, but she tries. I had heard good reports on this product called The Face Wrap. One of my colleagues had video of a barking Pom who magically quieted after the Face Wrap was put on. I had actually tried it with a client’s dog who was a fearful barker and didn’t have a lot of success with it, but I believe it’s because the dog was already over his threshold when we put it on. I have to report that it worked like a dream with Pip. A couple days before the workshop I desensitized her to it by feeding a liver treat whenever it appeared. Then I had her touch it with her nose and get a treat. Finally I laid it over her nose and fed her through the loop. When she was happy about seeing the Face Wrap come toward her, I criss-crossed it under her chin and snapped it behind her ears. Lots of treats then. She didn’t fight it as much as I thought she would. When she laid down calmly with it, she got treats. When she fussed about it, I walked away. 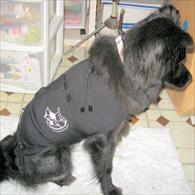 During our workshop sessions when the dogs were crated, I alternated having her wear it and go without it. There was a definite difference when she had it on – she was calm and laid down during the sessions. When she wasn’t wearing it, she was sitting up, staring at me and barking. 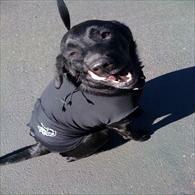 The dog on the packaging looks a little sad, so I wanted to take a photo of Pip wearing it happily! She can play with her toys, eat, drink and pant wearing it. She can even bark wearing it, but chooses not to!! So The Face Wrap gets a thumbs up from me. It’s inexpensive and made by the same company that makes the Anxiety Wrap. Not every product works on every dog, but this is something that’s definitely worth a try if you have a dog who loves the sound of his own voice. The Anxiety Wrap has already worked its magic on Toby. I put it on him the day we got it and he seemed very comfortable in it. It was a blue sky day. 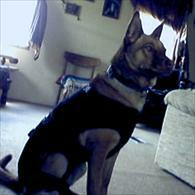 The next day, a storm rolled in and he began to get anxious, as usual (panting, pacing, jumping in my lap–he’s 70 lbs!) so I put on the Anxiety Wrap and his symptoms subsided considerably. I really think he feels more secure having it on! This will be a huge help to us. I have used Anxiety Wrap on Toby three times since and the results are truly amazing. He is so much calmer during storms when he’s wearing it! Thank you so much. 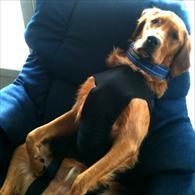 I have been very impressed with the Anxiety Wrap and Susan Sharpe’s separation anxiety program. My dog, Mollie, is a particularly difficult case because, in addition to her separation anxiety, she also is a door bolter. In consequence, there are two behaviors to work on, not just one. That said, Mollie has made remarkable strides in the right direction. When we first started the program, Mollie did her best to try to keep me from leaving the house. She would jump up and even rip my clothes with her teeth. Videos showed that she would continue to whine, yelp, and scratch at the door long after I’d left the house. After working with the Anxiety Wrap and the separation anxiety program together, I can now leave the house much more easily and Mollie’s distress quiets much more quickly – she will even lie down or retire to the upstairs bedroom! I LOVE your anxiety wrap. I put it on my very anxious dog, Puppy, and I saw a HUGE difference in attitude and a major decrease in compulsive licking. He would lick his blankets constantly which comforts him during stressful times. No More! When I get home from work, Puppy is the barkiest of my four furkids. I came home on Saturday and his barking was cut in half, fantastic. 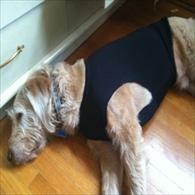 I tried the “Thundershirt” and it did not help with licking or barking. Thank you again for your product. 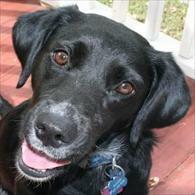 Maverick is a 3-year-old lab mix whom I adopted 1 ½ years ago from the Oregon Humane Society. He has become very dog-reactive in the past year. Maverick is very intense when he is outdoors. He is always scanning intensely for squirrels or cats. When he does see a squirrel, cat, or another dog, he barks and lunges. He is quite strong and has pulled me to the ground several times. It has become very challenging to walk Maverick and keeping a loose leash became almost impossible. We consulted with a veterinary behaviorist, who told me that Maverick has fear-related aggression. Drug treatment was prescribed, with varying results from each drug that was tried. None of the drugs appeared to have any lasting effect in reducing his anxiety. Someone recommended that we try the Anxiety Wrap. 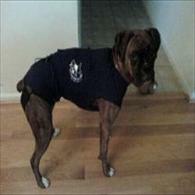 When it arrived, I put it on Maverick for 20 minutes or so indoors, so that he could get accustomed to wearing it. It seemed that he actually welcomed wearing the Anxiety Wrap. 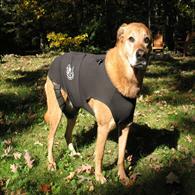 On our first day outdoors wearing the wrap, there was a noticeable reduction in Maverick’s overall intensity. He is still scanning, but without the “I’ve got to get it” intensity. When he does see a squirrel or cat, his reaction is less and he gets over it much more quickly. With a certain level of calmness in Maverick, we have been able to achieve good results with behavior modification. We have been able to reward him with food when he sees another dog and does not react. 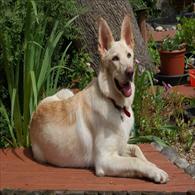 He has responded well to our training protocol and is now much less reactive to other dogs. It is truly amazing and I have recommended it to a couple of friend who’s dogs have issues with fireworks and loud bangs. We are still keeping the programme going and will continue to use it – having said that my husband had to dash out to collect a sick child from school and our neighbours thought he had taken Missy with him as she didn’t bark, even though he forgot to put the wrap on in his haste! Thank you. I am so pleased that she is so much less stressed when we are not around. Beth Hilton and a much happier Missy! 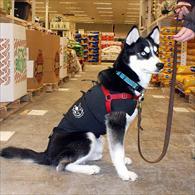 Here is a photo of Misha taken yesterday at Rural King, a store that allows dogs. We take him there often and use the wrap to help him cope with seeing new people. 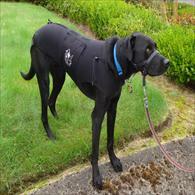 As you can see, I can easily fit his no-pull harness over the wrap. Thanks! 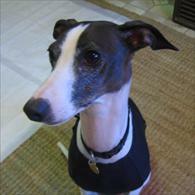 While looking around for a puppy to adopt (Jasper) I found a couple of products, one being the “Anxiety Wrap” for dogs. I read the stories and talked it over with my husband. We didn’t really have high expectations, but with a money back guarantee, why not try it. So I did. I measured Jack and Jade three times each to make sure I was getting the proper fit according to the sizing chart. WAL LA!!!! Jack no longer runs from Jasper or outsiders, and Jade is able to sleep through the thunderstorms. She stil wants to sleep on the bed with us, but she just lays down and goes to sleep. No climbing on my head and shivering as if she’s freezing. I can’t wait to start taking Jack out to meet people. We’ve not had the heart to do that he’s been so afraid, but now we feel confident that he will do fine. They all three love being petted and talked to. Thank you so much for your miracle working product. We have used the Anxiety Wrap 3 times since we have been in Florida for the winter. Each time our collie has settled down within 5 minutes. Last night it was less than a minute. The cause of her anxiety is still a mystery since we have had only one storm this winter. The other times she is just pacing and panting, unable to find comfort. Bonnie is mostly deaf now so it does not appear that she is being bothered by far off storms. I did see the neighbor’s cat sitting in the driveway at 2:00 this AM staring at the house. Who knows what animals can sense. We are so pleased with the Anxiety Wrap. Wish we could have known about it 20 years ago. It might have saved our dogs and us a lot of sleep. Since puppyhood Molly barked a lot at any noise, especially the doorbell. She also barked/suffered anxiety around other dogs (except for our other Lab) and she eliminated in the house if alone, which was diagnosed as separation anxiety. We tried training methods at the recommendation of our vet. We tried crating her when we weren’t home. We also tried anti-anxiety medication but we want to find an alternative to medication. My dog Maggie is a rescue who has an unknown background. All the shelter knew is that she was picked up by animal control after being found with a pack of dogs chasing bulldozers. She appears to have been abused at some time since she’s very skittish around men, but in the year and a half that I’ve had her, she’s made a lot of progress. Her issues are general anxiety, separation anxiety, and noise phobia (especially thunderstorms and fireworks). I did have to start her on medication, but the anxiety wrap has helped her greatly and will hopefully replace her medicine soon. I use it when I know an anxious event is coming and as soon as I put in on her, she calms down immediately. She made it through a noisy thunderstorm a few weeks ago, with her only reaction being one raised eyebrow. Before the wrap, there would have been pacing, yawning, and drooling. We call the wrap her “nervous sweater”. She even seems to know that it’s going to help her since she gets very still when I put in on her, and she licks my hand afterward; her own little, “Thanks, Mom”. I think the cat gets jealous he doesn’t have his own clothing, so maybe I’ll get him one too. Maggie’s vet thinks we can wean her off the medication soon and we’re hopefully going to get trained as a pet therapy dog. She’s improved so much. And to think that such a short time ago, she was in a dog gang, living on the streets! The Anxiety Wrap has become a valuable tool for my work counseling pet adopters with problems they are having with their pets. In my own life, it has been very useful helping my adopted English Springer Spaniel, Tag, deal with his Separation Anxiety. The “Anxiety Wrap” was a great success at 3 a.m. this morning. We had a storm that was a beauty. The lightning was terrific and the thunder was right over us. It rained buckets. In fact, the storm finally moved on – only to return with more fire works. When the storm first broke Brijit was a wreck until I put her “Anxiety Wrap” on. In less than 10 minutes, she was on the bed with us, snuggled up to Rol’s legs and actually lying down with her head flat on the bed. It was like watching a miracle. Occasionally she would lift her head, look around sort of listening and then settle back down. The storm lasted over an hour with lots of lightning and thunder and you’d never know Brijit was the same little dog had been SO afraid of storms. I have used the anxiety wrap after listening to a video. I worked extremely well. Taffy shakes and paces and pants when storms are around us. After a few minutes with anxiety wrap she laid quietly and went to sleep even through lightning and thunder. I have recommended the wrap to several dog owners already. My anxiety wrap arrived yesterday. Just in time for more storms in our area. I thought about trying it on Wilson right away as the storms were set to arrive later in the day and I wanted to have a stress free time to try it out for the first time. He didn’t mind at all when I put it on him and immediately went and laid down. 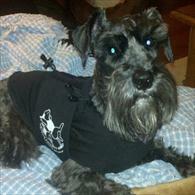 Not to mention that he looked pretty cool in his new vest. I left it on him for about 20 min. Later in the day, he knew the storms were coming before I did and when he first showed signs of nervousness, on went the wrap. I was thrilled at the results. He had a couple of times where he had a little whistle sound coming from his nose but no real crying or panting. In fact, when my husband came home and found him laying on the floor, sleeping, he was amazed. After the storms subsided, I took it off him. In the middle of the night, he woke me up with his hot breath in my face and panting. I realized there must be more weather coming our way. I got up and put the wrap on him. We all went back to sleep and the thunder and lightning came and went and didn’t ruin our night. I am so happy my friend told me about the anxiety wrap and glad that because of Temple Grandin, I didn’t think it was all smoke and mirrors. The reason it works is irrelevant to us. It works and that’s the important part. Our dog can now go through Summer without the stress and loss of sleep he used to experience. Not to mention our loss of sleep and anxiety about his behavior. 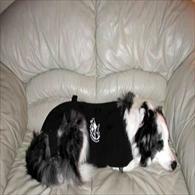 I will be telling all my friends with pets about the wrap and how great it works. Thank you so much for developing your idea to help out all the nervous nellies in the animal world. I can’t thank you enough for the help – Molly seems like a brand new dog! She’s currently relaxing right next to me 🙂 She wouldn’t have done this without you! I used the wrap last night as instructed for a thunderstorm. It took about 10 minutes until he was totally calm, lying down, and ignoring the storm !!! Unbelievable !!! A true miracle. Thank you for the Anxiety Wrap and Face wrap. 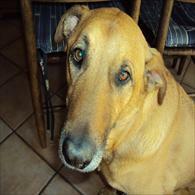 Our dog Sunny suffered with a deep wound to the metacarpal pad on his right foot for over eight months. 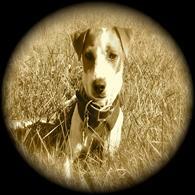 He was in a lot of pain which affected his disposition even to the point of aggression with our other dogs. When wearing his Anxiety Wrap and Face Wrap there was a noticeable improvement in his behavior. 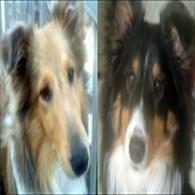 The on-going panting stopped, the restlessness stopped as well as the aggression toward our other dogs. He was able to relax and sleep; something he had not done for months. Fortunately we were able to treat and eventually heal his wound using laser therapy. Thank you again for your wonderful products. 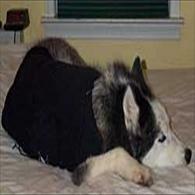 Last April 2011 I bought an Anxiety Wrap for Nykki, our seven year-old husky mix. In the spring of 2010 she was startled (as was I) by a very close lightening strike and thunder roll. She immediately displayed fear of thunder storms, and, like other dogs, became quite accurate at predicting their arrival or close passage. Her distress was intense. While we could find a couple of places in the home where she would go during a storm, Nykki would not reappear for hours after it passed and remained very wary for long periods thereafter, sometimes for days. Inevitably, Nykki’s fear of thunder generalized to other loud noises, like fireworks, even coming from the TV. We tried a sound desensitization program with her, which she could tolerate, but it did not really reduce her stress during the real thing. One day I browsed a number of websites for the Anxiety Wrap and similar products. Descriptions of these products, and the rationales for their designs led me to conclude that “Da Wrap” (as we now call it) was most worth a try. Upon Da Wrap’s arrival I followed the sensible instructions to familiarize Nykki with putting it on and wearing it. We then got to try it through a couple of heavy rains. Finally, Nykki faced a couple of thunder storms in Da Wrap. Now, I would not say that she is blasé anticipating or during a storm. But she does not pace, or shake, or scratch to get out, or desperately pant. Mostly, she seeks out a quiet place and calmly waits out the storm. Really loud thunder grabs her attention, and she may come seeking solace, but she remains calm and in control. She’s not a happy dog during a storm, but she’s not scared and anxious. Da Wrap has worked well for us. I know that Nykki recognizes that it works because she follows me to where Da Wrap hangs and literally helps me get her into it, standing still, lifting her front paws to step into the leg holes, and waiting while all of the velcro attachments are done. Then she gives herself a good shake, and up pops her curled tail – she’s ready to face the worst. I asked for 2 Anxiety Wraps, one for our Beagle Burnsie and one for our Shephard/ Collie Mix Lucky Boy. Both Dogs were Strays out of our Park. Lucky looses all his cool when Thunder is eminent – he tries to get outside, crawl over our Chain link fence and run around in circles. He found himself the safest spot in our house – with his face under my husbands bed. He breathes very hard, shakes with all his body and curls up to a ball. With the wrap he gets back to breathing normal, still likes to lie in front of my husbands bed but is totally changed when wearing the wrap. I am so thankful that you invented it and I got to knowing about it. Burnsie the Beagle, has not worn it yet. He is more scared of shooting and such notice which is bad since we live close to an military installation. So far I did not put the wrap on him and cannot tell you results since shooting happens not quite as often. Before I know it the shooting has stopped. Thank you for this wonderful invention. Our 15 year old Sammy has been wearing his Anxiety Wrap for about 2 years now. And when Abbey, our 8 year old, started showing fear of thunder and fireworks, we decided it was time to get her own mini wrap. Just in time for 4th of July celebrations. We first bought the wrap as a “let’s see if this really works” mentality. And when it did, we were ecstatic! I have friends whose dogs have similar issues and when I told her it really works, they were very excited. Thanks a lot for giving my babies a peaceful state of mind at a moment where all they knew was fear. We got our anxiety wrap and I was able to take Lady for a normal walk last night ! Ya Hooo ! After the fourth of July, Lady would not go in the yard after dark, or for her normal evening walk (which she usually loves). She would listen for unusual noises and drag me back to the front door. Last night, I put the wrap on her and we went walkies!! She would put her head up once in a while to listen for firecrackers and then continue to sniff around and do her doggie thing. She looks really cute in it. I wanted to let you know the Anxiety Wraps have worked on both dogs during thunderstorms and for 2 days I have used the Face Wraps. Yesterday for cutting their nails and brushing, which usually involves biting and running away, but not a problem with the Face Wraps on!! Today I used the Face Wraps on one of my dogs when I babysat children that are afraid of dogs. I always put the dogs in my bedroom and usually my lab claws the door and barks constantly. With the Face Wraps on and only a few snaps of my finger it went 90% better today!! A few barks, but no clawing and they were both very calm when the children left and they were let out of the room. and they have really enjoyed the treats and praise. THANKS SO MUCH FOR PRODUCTS THAT WORK!!! 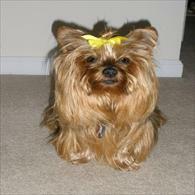 I have used the Anxiety Wrap on my Yorkie, Coco, about three times with success! The most amazing thing is that last storm – she was fine! I didn’t even need to put it on. She neither panted nor shook! Has anyone else had this happen? My sweet Petey is 6 years old. Fairly recently he has shown extreme anxiety when there are thunderstorms. He would hide in a corner of the bathroom, laundry room or closet and shake like a leaf in January. So I purchased an Anxiety Wrap just hoping it would help. Boy, what a difference. When I hear thunder in the background I immediately put the Anxiety Wrap on and right away he remains with us and even will play. Everyone in the family makes fun of me, but it works and so that is all that matters. Thanks so much for helping my sweet Petey. The Face Wrap – What a great product! It works exactly as you said it would! In fact, I saw an instant, positive response the very first time I used it. Now Grace Mostly just wears the wrap. I’ve used it very little on her. Jasmine also responds positively sometimes just by seeing it and/ or wearing it. She’s quite stubborn, so she’s in it a bit more, but her attitude about making noise in the car has improved greatly. Lots of peace and quiet now when riding. So – Thanks for the product! And thanks for your help when I called. I’m so glad I saw your ad. So are Jasmine and Grace and all who ride with them. Ps Hope you enjoy the photos! 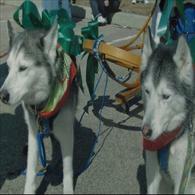 The husky on the sled is a stuffed dog and not real. 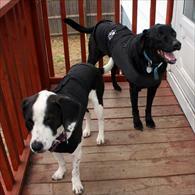 I used the Anxiety Wrap for the first time on my two dogs this past weekend to help them thorugh Hurricane Irene. We had to go to the basement for a while to ride out tornado warnings in our area. The dogs were perfectly fine!! Both dogs have developed a fear of thunder since July 4th. Now using the wrap, they did great! Both dogs were running around, even playing during the storm. Thank you, thank you! It WORKS! This summer was particularly stormy in Colorado, which caused my dog, Buford, a great amount of angst. It got to the point where even a plane passing overhead on a cloudy day put an abrupt end to our walk. Over the course of the summer, he became increasingly nervous and spent a great deal of time trembling in the bathroom and panting in the tub. A friend who had heard about the Anxiety Wrap mentioned it to me. With Buford regularly on the verge of a nervous breakdown, I decided it was worth a try. The violent weather has subsided since Buford’s Anxiety Wrap arrived, so it was initially hard to tell if it really worked. Today I got out my George Foreman grill, then noticed Buford had gone outside and had his tail tucked between his legs. The beeps from the grill are another source of emotional discontent. The sound results in him seeking the greatest distance possible and, of course, trembling severely. I stopped what I was doing and put on his psycho swaddle (as I like to call it). Just after the machine beeped Buford was smiling, tail-wagging, and playing with a toy. I was amazed at his lack of reaction to the noise. Thank you for helping calm his frazzled nerves, Anxiety Wrap! I am spreading the word to friends with nervous dogs. 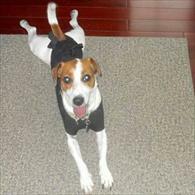 Reilly is a three year old Jack Russell with serious reactivity. 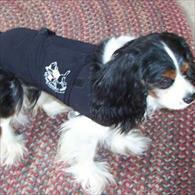 We’ve tried other wraps, behavior modification, etc. and had little to no success. His breeder and trainer both recommended the Anxiety Wrap. 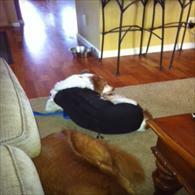 During Hurricane Irene, Reilly actually slept through the entire thing – even though we were hit hard. Now, whenever a storm approaches, Reilly will seek out his Anxiety Wrap and remains calm. Thank you for this product. It has given us our lovable little guy back. Tonight is our first time using the Anxiety Wrap, fireworks were the challenge. Our dog went from a teeth-chattering, shaking, quivering, drooling pathetic mess to relaxed, happy and calm enough to play a game of fetch. It was so amazing that I just called one person and emailed two other friends with scaredy dogs and posted a testimonial about it on Facebook. Wonderful product, and you can be sure that we will be telling lots of people about it. We thank you and Midnight thanks you! I ordered an anxiety wrap several months ago after doing much research. I chose to go with the anxiety wrap over the famous and over advertised “thundershirt.” I must say that the results were OUTSTANDING. My giant labradoodle who is horrified of fireworks and thunderstorms and basically any loud noises has completely calmed down. Before the anxiety wrap it was impossible to even get him out for a walk eve a day after the fireworks but now he will tolerate small firecrackers and mild storm conditions even without the anxiety wrap! He no longer shakes at the pops and bangs but rather calms himself down however, I do put it on him when I see that he is not handling the situations on his own and magically he calms down relaxes and curls up. I am so happy and so pleased with the results that I had to write! Julius’ progress with the anxiety wrap has been wonderful. I read about it 7 years ago when we adopted Jake when he was 2 yrs old. He’d been abused, and not socialized. Poor guy. Terribly scared of everything. Worst part was that we liked to go to the cabin on the weekend (about a 2-hour drive) and he would have “panic attacks” in the car. We ordered the Anxiety Wrap, and he magically slept the whole way to the cabin, the first time he wore it! He has now worn out his second Anxiety Wrap, which is why I am reordering. Bogey is wearing the anxiety wrap right now (with my supervision) because he was freaking out about the neighbor shooting a bb gun. That is another one of his triggers. Looks like a combination of the anxiety wrap and a leash…doing pretty well right now. Thank you for providing not only a remarkable product, but also the assurance and hand-holding necessary to help us believe that after so many painful years, there was yet a way to relieve our dog Abby’s severe separation anxiety disorder. 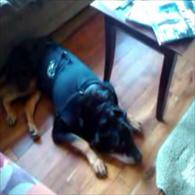 It was very difficult to trust that after so many incidents of Abby damaging the house, our car, her crate and even herself when we left her alone that she could be calmed by wearing a simple vest and by us temporarily modifying our behavior around her. Yet, this was the answer. We had tried so many other approaches over the past eight years, including a lengthy evaluation by a team of doctors at Purdue University, various medications and holistic approaches, all sorts of training techniques and even adopting a second dog. We were never able to get beyond the use of a crate, in combination with two different prescription medications, which required advanced planning whenever leaving the house. We also came home each time to large volumes of drool and a hyper active dog that was both dehydrated and exhausted. We read about the Anxiety Wrap vest online and in our love of Abby, decided to take yet another shot at a more humane solution. 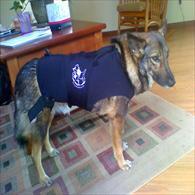 We began using the vest and the face wrap, and temporarily began ignoring Abby while at home. While the latter step was heartbreaking at first, it was far less painful than watching her continue to suffer in her crate. We then took the huge leap of faith of leaving Abby out of her crate as we left the house. It nearly brought tears to my eyes the first several times coming home and finding her calm and the house without the least bit of damage. She no longer follows us to the door as we leave. In fact, I nearly crack up each morning when I attempt to let the dogs out for one final potty break and she refuses to leave her favorite spot next to the couch. She is much more interested now in the Kong and treats I leave behind than in me leaving. Abby remains on Prozac, but not on the harsher anxiety medication we would use each time we left. We also still hold our breaths at times when we leave, since her progress is almost too good to be true. (We have joked that we should have our own vests.) But as each week passes without incident, our faith builds, as does our appreciation for the Anxiety Wrap. I cannot say enough good abut this product and encourage anyone in our shoes to give it a try. Once again, we have tried all the other alternatives and can tell you this worked like none of the others. My rescued poodle mix SuzieQ has severe barrier frustration when she has anxiety about thunderstorms and separation. Her Anxiety Wrap worked better than most of the sedatives she had been on since it worked almost right away. Zelda will go hide I’d there is noise from hairdryer, thunder, fireworks and even my wife and I. She won’t come to us when we call. This was before the anxiety wrap. Now with the Anxiety wrap, nothing seems to send her running. She now comes to us and puts her paw on our lap when we call her. She doesn’t fight with our other dog Tazz anymore either. We are impressed with the Anxiety Wrap. 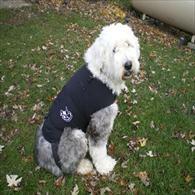 My sister Sophie an Old English Sheepdog was a nervous wreck before our mom purchased her the Anxiety Wrap. The first time worn during a thunderstorm she just laid down and went to sleep. What a relief for all of us. Mom couldn’t believe what it did for her. A BIG dog Thank You from all of us. I have so, so many people asking me about the effectiveness of the Anxiety Wrap on my dog Julius and people are so surprised and happy for such a great outcome for him. Everyone seems to know a dog who needs one. Julius is now able to play at the dog park without ANY fear/aggressive behavior. I am so thankful to you. Another use for the Anxiety Wrap! Bobo the cat loves to go outside, but we live near 20 acres of woods inhabited by coyotes, wild turkeys and fox. Bobo has been able to escape from all of his previous leads. The Anxiety Wrap appears to be the only lead which is ‘bolt free’, and now we both feel safe when he explores his territory. My dog, Daisy, has barked all day. I woke up with a migraine early this morning. So when I went to get my mail…there was the anxiety wrap!! I put it on her and then there was..quiet bliss. If my head wasn’r hurting so bad I would have jumped up and down singing hallelujah! I left it on 40 minutes. She was so calm, not during circles, panting or barking. I did the video of daisy having her spell, then after I put the anxiety wrap on. I am so amazed at the complete difference. After almost 4 years of this behavior, even my friends are amazed. This was really a blessing for her and me. Thanks so much. I’m writing this approximately 15 minutes after putting the wrap on my 2 year old rescued Schnauzer for the very first time. I’ve seen him curl up & fall asleep rather quickly in the past…but not this quickly. Not this comfy & content. He’s a great pup…lets me brush him, brush his teeth, clean his ears, clip his nails, bathe him, etc. He’s not a huge fan of his winter fleece coat but he gets cold so quickly! 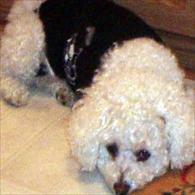 Toby’s anxiety is unfortunately caused by a handful of triggers – traveling, loud noises, separation. Just this morning my poor pup shook like a leaf after a car backfired. I know its only been less than hour, but I have a feeling this wrap is going to do wonders for Toby’s security & comfort, and my peace of mind. 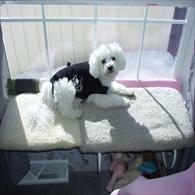 THANK YOU so much for providing the future help I know this product will provide – for both me & Toby! PS – my neighbor unexpectedly lit some firecrackers & fireworks. I scrambled to put the wrap on Toby, who was shivering & shaking. He calmed down in half the time it usually takes him. I have high hopes for tomorrow’s 2 hour car ride ! Thanks again. 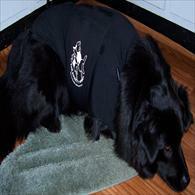 Katydid, our youngest Collie, experienced increasing and severe anxiety when storms approached. We were stumped as to what to do to help her. She would pace and trot non-stop for hours on end. She shivered, panted, drooled, and was unable to focus on anything else but her own distress. Nothing we tried had any effect until we found The Anxiety Wrap. With The Anxiety Wrap’s gentle pressure, within a few minutes Katydid stops pacing, curls up on the couch, and is able to wait out the storm. Hope – I wanted to let you know we tried the Anxiety Wrap on Tucker during the thunderstorm today. What a difference! He slept peacefully on the bed next to his sister and didn’t pace the floor as usual. Thank you so much for your assistance and guidance. I will keep you posted as we continue to utilize the Wrap. She sent me this photo that I am attaching of Tucker sleeping while someone was vacuuming. She told me that without the wrap, he would be running away from the vacuum and hiding in a bedroom. As it’s turning out, all I have to do is show the boys their Calming Face Wraps™, which they welcome – come running up to me, wag their tails, “this belongs to me!” – and then wish I would please take it off them. Ten minutes of “no barking,” said in a very quiet voice, with the Calming Face Wraps™ in place, and the boys decide they’d really rather come back in the house, where the face wrap is immediately removed. This is a super lesson – I can bark, but I have to come inside the house to bark. We are delighted. We love it that they think the Calming Face Wraps™ belong to them – don’t dread them at all – but they don’t want to wear them, a few minutes is all it takes and they come right into the house to have them taken off. Our little rescue girl, Sassy, gets very nervous in thunderstorms. We tried comforting her and she would not have any part of it. She didn’t want to be held or comforted in any way. She paced and barked and tried to get away from the thunder. I ordered the anxiety wrap and followed the directions and shortly after that we had a spring thunderstorm. When she let out the first bark I got her wrap and put it on her, we were so surprised when she laid down and fell back to sleep. Since that night we have had several thunderstorms and each time we put her wrap on and it really makes a huge difference. The only time she got upset was one of those huge rattle the whole house claps of thunder, and at that she barked and paced and shortly after that returned to her restful slumber! Thank you for helping our girl feel more secure and let us all sleep better. 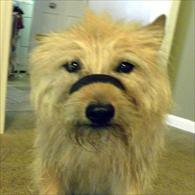 I highly recommend the Face Wrap, particularly for dogs with anxiety-related barking. Every dog I have placed the Face Wrap on has responded with an almost immediate cessation of barking, dramatically improved focus and calm, relaxed behavior. WOW! What a difference the Face Wrap has made on my old girl. I received it on Friday from the New Zealand provider…and started introducing Mils to it…she accepted it immediately and seriously within minutes the ‘wild’ look had melted away from her eyes…she is way less reactive to the other dogs, barks less, and is so much calmer…ALREADY…words just can’t describe what a relief it is to have her more relaxed!!!! It means I am now able to quietly and gently work on her behaviours again. Thank you for your support…it has been wonderful. Have the absolute best day! 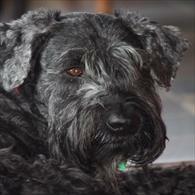 Leanne….and the whole Giant Schnauzer gang in New Zealand. A heavy thunderstorm was approaching and he started shaking terribly. After wearing his Anxiety Wrap for about 10 minutes, you can see he is gradually moving from nervous becoming relaxed enough to smile for the camera! We cannot thank you enough for this product and recently purchased two more. Hello – last week, our anxiety wrap came. We had 3 nights of thunderstorms in the first 4 days after our order arrived. Unlike before, Emmie did not shake when she had her wrap on!!! This is monumental!!!! Thank you SO MUCH for the wrap! I just want to let you know how great the anxiety wrap is! Lola, my 4 year old chihuahua is afraid of thunder, rain, fireworks, sirens and any other loud noises. She starts shaking, panting and hides in the corner. We had a major storm and I put the anxiety wrap on her hoping it would work. Wow…I couldn’t believe my eyes! At first Lola was scared of the anxiety wrap as she never wore anything before (besides a harness). Within minutes, Lola was on the couch and sleeping like a baby. The thunder, wind and rain didn’t bother her at all. She was so calm. Thank you anxiety wrap! I just wanted to thank you profusely and say what a godsend the Anxiety Wrap was during Hurricane Sandy. I purchased 1 for each of my 2 dogs earlier this summer as my oldest, Taylor, (he just turned 10) just wasn’t dealing well with thunderstorms anymore. My youngest, Lucy, (3, almost 4) has issues when meeting people. I have been using successfully all summer for thunderstorms and have been using it on my walks to help Lucy stay calmer when we walk (she’s a rescue and is very timid around other people). Last year during Hurricane Irene I “drugged” Taylor with a small dose of Benadryl to take the edge off. Lucy seems to almost react more to what the Taylor does than the actual storm. It worked fairly well. I was waiting until the storm got closer before I put the dogs in their Anxiety Wraps, but Sunday afternoon I just couldn’t deal with Taylor’s nervousness anymore. Apparently he sensed the pressure change and figured thunder was coming. I got the “kids” into their wraps and Taylor finally laid down on the blanket rather than look to me for comfort. 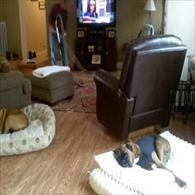 I closely monitored them to ensure the storm wasn’t overwhelming them. Taylor and Lucy were content to sleep on their blanket just like normal as if the storm wasn’t even happening. It was so awesome to get through the storm without having to “drug” Taylor. I always hated doing it, but he was so nervous I had to do something. Thank you for such a wonderful product. While I know it doesn’t work for every dog, it sure works for mine. Sofie during a severe thunderstorm she is aware of the storm but is comfortable and no shivering shaking or distressed. Bill and I are thrilled and so pleased that we have got Sofie her Anxiety Wrap. We will be highly recommending this to all. Had one that was destroyed by briars but it worked fantastic. 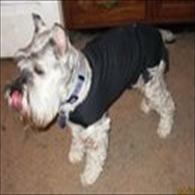 I then tried the thunder coat cause we could go right to the store and get it, well, not so good. Will stick with the anxiety wrap! I bark a lot. I bark for no reason. The second my parents put this on me, I laid down and became instantly relaxed. It’s amazing what a simple band can do for a case of the non-stop barks! This is the second wrap I’ve ordered for my older dog Jade. So, I didn’t measure her again, but ordered the same size she has. The anxiety wrap has made such a difference in the quality of Jade’s life (and ours) when it storms, or the neighbors set off fireworks, or during hunting seasons, or when we are not home. It has a truly calming effect on her. I noticed the prices have dropped considerably since I bought the first two for my dogs, but they were well worth the expense. 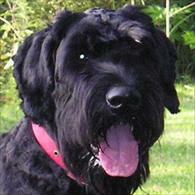 “I was simply amazed at the difference in our dog. After the first 20 minute “trial” period we could not settle him in one spot to take it off. He kept avoiding us – he looked so happy and peaceful – he didn’t want us to take it back from him. So we kept it on until bedtime. 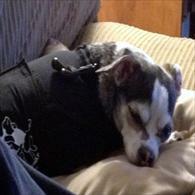 Before the anxiety wrap he suffered from separation anxiety and got stress induced colitis. My husband wanted him kenneled all day after he chewed through two couches. I just didn’t have the heart to do that. With the anxiety wrap the calming effect was IMMEDIATE! He obviously knew it was a good thing and doesn’t like to have it taken off. He now just saunters sleepily towards me when I’ve come in the house – before he use to frantically greet me at the door.